The first edition of Tropical Rain Forests: an Ecological and Biogeographical Comparison exploded the myth of ‘the rain forest’ as a single, uniform entity. In reality, the major tropical rain forest regions, in tropical America, Africa, Southeast Asia, Madagascar, and New Guinea, have as many differences as similarities, as a result of their isolation from each other during the evolution of their floras and faunas. This new edition reinforces this message with new examples from recent and on-going research. After an introduction to the environments and geological histories of the major rain forest regions, subsequent chapters focus on plants, primates, carnivores and plant-eaters, birds, fruit bats and gliding animals, and insects, with an emphasis on the ecological and biogeographical differences between regions. This is followed by a new chapter on the unique tropical rain forests of oceanic islands. The final chapter, which has been completely rewritten, deals with the impacts of people on tropical rain forests and discusses possible conservation strategies that take into account the differences highlighted in the previous chapters. This exciting and very readable book, illustrated throughout with color photographs, will be invaluable reading for undergraduate students in a wide range of courses as well as an authoritative reference for graduate and professional ecologists, conservationists, and interested amateurs. 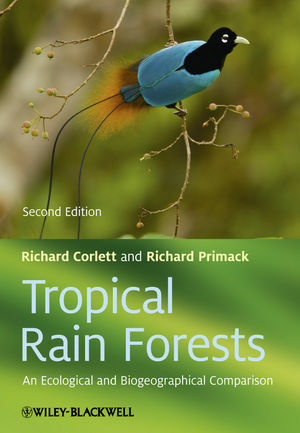 Richard Corlett, a Professor at the National University of Singapore, has studied tropical rain forests in New Guinea, Southeast Asia, and southern China. His major current research interest is in how rain forest plants and animals survive in human-dominated landscapes. He has previously taught ecology at the University of Chiang Mai, in Thailand, and the University of Hong Kong, in China, and is author or co-author of several books on the ecology of the Asian tropics. Richard B. Primack, a Professor at Boston University, is the author of two leading textbooks in conservation biology and is the Editor in Chief of the journal, Biological Conservation. He has carried out research in Central America, Malaysia, and Australia, and is currently studying the impact of climate change on plant and animal communities. He is a former President of the Association for Tropical Biology and Conservation. 1 Many Tropical Rain Forests. What are tropical rain forests? Where are the tropical rain forests? Origins of the similarities and differences among rain forests. 2 Plants: Building Blocks of the Rain Forest. Rain forests in New Guinea and Australia. Conclusions and future research directions. 3 Primate Communities: A Key to Understanding Biogeography and Ecology. Old World versus New World primates. Primates as seed dispersal agents. Herbivores of the forest floor. 5 Birds: Linkages in the Rain Forest Community. Fruit size and body size. Comparison of bird communities across continents. 6 Fruit Bats and Gliding Animals in the Forest Canopy. Bats as pollinators and seed dispersal agents. 7 Insects: Diverse, Abundant, and Ecologically Important. 9 The Future of Tropical Rain Forests. The forces behind the threats. Saving the many rain forests.